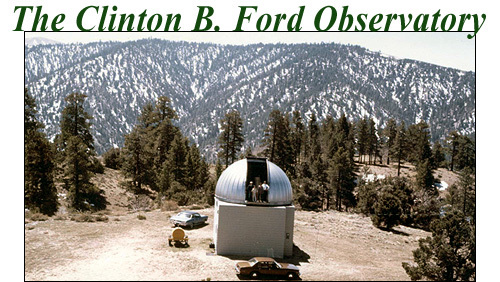 From the start, Ford envisioned an active co-operation between the Ford Observatory and the AAVSO. The original Mount Peltier Association members were all AAVSO members as well. 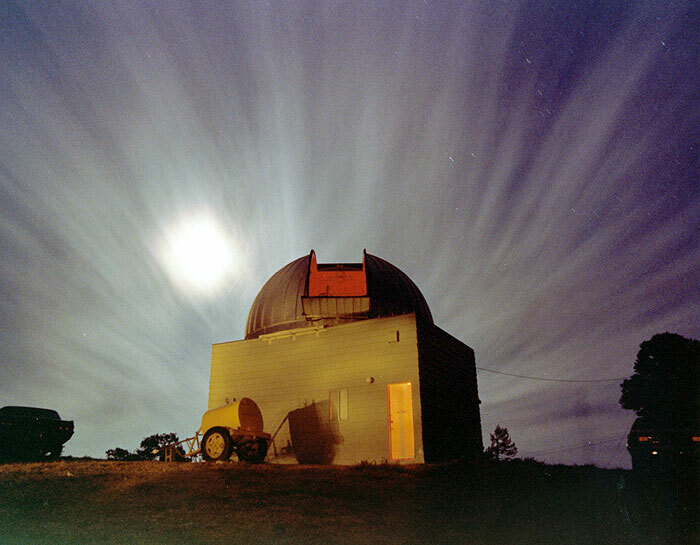 Among the many projects and activities at the observatory over the years were: visual observations of variable stars; astrophotography; a program of making photographic plates of star fields for new AAVSO charts; star parties; nova and supernova search programs; CCD/computer imaging of planets and deep sky objects; photometry; asteroid searches; comet observations; visual planetary observations; and many more. All observations were recorded and reported to the proper agencies. The spirit of co-operation continues today as several users of the Ford Observatory are making visual observations there for the AAVSO. Elevation: 7,474 feet above sea level. Instrument: 18-inch, f/7 Newtonian reflector (built mainly by Clifford Seauvageau of Detroit, Michigan), used for variable star observations by AAVSO member Claude B. Carpenter, of Menifee Valley, California. Donated by him to the Ford Observatory when seeing conditions at his location became poor due to development. Observatory: two-story building, 21.5 feet square; 21.5 ft., 3.4-ton dome with twin 3-ft. wide shutter doors. Wooden dome replaced by an Ash dome in August of 1972, cf. pages 32-33. Reference: Cragg, T. A. 1966, "Ford Observatory in California" Sky & Telescope, 31, 3 (March). 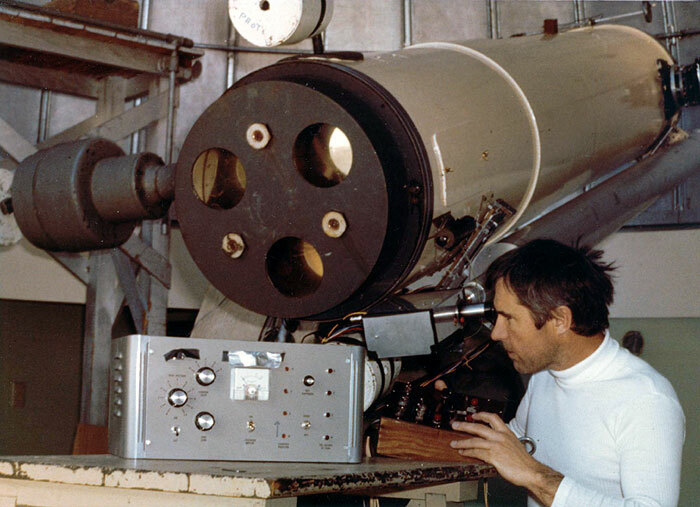 Left: Father Ronald Royer at eyepiece of the 5-inch f/20 guide telescope, mounted on the 18-inch f/7 Newtonian reflector. (1978) Middle: Steve Padilla, Clint Ford, Ron Royer (November 1982). Right: Observatory at dawn. Click the images to enlarge. All photos from the AAVSO Archives, C.B. Ford Collection. Pages from the Ford Observatory log books are available from 1965 to 1987. Thank you to Msgr. Ronald Royer and Kate Hutton for their efforts in getting these pages online. The Mount Peltier Association was organized on October 23, 1964, by Claude B. Carpenter, Clinton B. Ford, and Larry C. Bornhurst--all active AAVSO members at the time. Leslie C. Peltier was named an Honorary member. The Mount Peltier Association was a name coined by Clint Ford for those who took part in the original observatory installation. We were later asked by the U.S. Forest Service (the observatory was on National Forest land leased from the Forest Service) to feature the name "Ford Observatory" with the idea that the name would stimulate more public interest. Clint, however, never used that name for us, preferring "Mount Peltier Association"—the actual group of members, instead of "Ford Observatory"—the name for the facilities. The observatory was built for and by serious amateurs mainly to do photoelectric work on variable stars and to have an observatory close by the Los Angeles area. It has been used for various targets of opportunity such as asteroid searching methods and astrophotography mainly by Ron Royer. Larry C. Bornhurst, electrical contractor and AAVSO member, relocated 18-inch to Angeles National Forest, and built Ford Observatory there. He became superintendent of Mt. Wilson Observatory and later at Kitt Peak, AZ. Claude B. Carpenter, owner of the 18-inch f/7 Newtonian. Avid AAVSO member and astrophotographer from Michigan. Moved to Southern California, his big scope located in the Menifee Valley. We called him Claudius, THE EMPEROR. Thomas A. Cragg, great visual observer, Griffith Observatory guide, Mt. Wilson Solar Observatory astronomer, Chief night assistant on giant AAT scope at Siding Spring, NSW, Australia. Used Ford Observatory often before going down under. Clinton B. Ford, financed the Ford Observatory project. Flew out 1st class twice a year on American Airlines to follow Miras through minimum. Could have done that from Wilton, CT, if he had a CCD camera! But then he would have missed sitting next to Dolly Parton on one trip! Ernest O. Lorenz, of Long Beach, CA. AAVSO member and solar observer. Worked for CalTech, Pasadena. Leslie C. Peltier, of Ohio, prolific variable star observer and comet searcher. Admired as a model for amateur astronomers. Arthur J. Stokes, of Ohio, AAVSO member skilled in Photoelectric photometry. He envisioned doing PEP on CVs. All of these men are deceased, except for Larry Bornhurst. After leaving Kitt Peak, Larry bought a yacht and sailed from California through the Panama Canal up to Connecticut, and visited Clint Ford unannounced. Larry did great things and then moved on to others, e.g., doing the whole Baja Peninsula Highway #1 in one record-setting endurance run on a Harley-Davidson so fast that the Mexican authorities didn't know what flew past them. No paperwork or permits that way. Larry now lives in the Tucson area and works at observatories, even at the Vatican. Thanks Larry, without you there would have been no Ford Observatory! Gerald A. (Gerry) Bilodeau, Los Angeles County Court worker. Introduced to Ford Obs. by Tommy Cragg. Became avid visual variable observer in the 1970s at Ford Obs. Jack Child, amateur astrophotographer of Orange County Astronomers, CA. Used 18-inch frequently. Did galaxy images with Royer for the Supernova Search Charts published by Thompson and Bryan. Began doing asteroid fields for Eleanor (Glo) Helin's Caltech search group following the recovery of 1980 AA on photographic plates taken at Ford Observatory. Subsequently began a program of asteroid astrometry at the observatory using an SBIG ST-6 CCD camera. Scott Craig, and his friend Chris McHale. Scott was a Disney Mickey Mouseketeer. When we had open house observing for nearby summer camps, and he was with us, the young girls always recognized him without being told his name! Observing stopped and autographs began. Leon A. (Lee) Frigon, astronomy friend of users of Ford Obs. in the 1970s. Lawrence E. Hazel, AAVSO member/observer and friend of Clint Ford, helped with charts. Cliff Holmes, enthusiastic member of Riverside Astronomical Society. Sparkplug of the Riverside Telescope Makers Conference still held each Memorial Day weekend at Camp Oakes in the San Bernardino Mountains of California. Cliff died in 1993. Bob Jones, friend and co-observer of Bilodeau. Mike Jones, student from Texas at Citrus College precision optics courses in Glendora, CA. Still in the optics field after taking top honors at the College. James Kent, director of Citrus College Optics program. Charles T. Kowal, Caltech astronomer who got to know us at Ford by doing a possible SN confirmation for us in 1973 with the 200-inch scope at Palomar. Proved false, but Ford got an autoguider from Charles as he was making one also for his use in long guiding sessions. He needed one, discovering over 100 SNae, 19 asteroids, several comets, and 2 moons of Jupiter. Mike Marcario, Citrus College Optics and avid observer. Later became night assistant at Mt. Wilson Obs. Mike died in 1998. Steve Padilla, Citrus College Optics, and avid astrophotographer. Now at Mt. Wilson Solar Obs. Marty Poissant, young astrophotographer and videographer from Long Beach, CA. Very frequent observer at Ford. Went on to be a Hollywood TV technician and program director. Ronald E. Royer, Citrus College Optics. Catholic parish priest. Observer and astrophotographer. Made 4-inch f/5 astrograph. Used spectroscopic plates for tricolor separations. Took many plates for AAVSO charts. Charles E. Scovil, Stamford Connecticut Museum Observatory director. Very involved with AAVSO chart photos and production, bringing AAVSO charts towards perfection. Rick Sorensen, Citrus College Optics. Went on to military optics, secret stuff, etc. Very talented at his job. Loved Ford Obs. Rick died in 1997. Bill Williams, Young amateur astronomer from New Jersey. Developed a dry ice cooled camera with a plastic plug to prevent condensation. Awkward but effective. 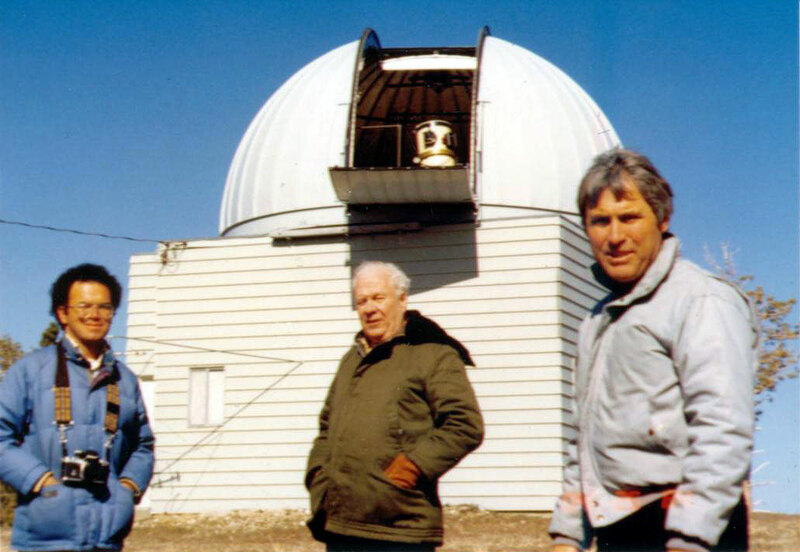 During the early 1990s two teams had done most of the observations: the Royer team—with Tom Cave, Steve Padilla, Marty Poissant, Dave Phelps, Rick Sorensen, and John Stevenson; and the Jack Child team--with John Rogers, and Greg Fisch.